For the director of “Germany’s Smallest Opera House” (which by the way just has got twice as big) there is little doubt: Benno Mitschka wants to create THEATRE with his opera productions far away from the Biedermeier sitting rooms of the 19th century. Our travelling reporter reports. Performing or playing with paper theatre is very often referred to as a hobby, or even a nostalgic hobby. The old sheets, often as copies or reprints, are carefully mounted and painstakingly cut out and arranged as beautiful pictures on a stage, often a copy of a well-known theatre – in Denmark usually the Royal Theatre in Copenhagen with its Acropolis front curtain, thus recreating popular theatre performances of the past. And there is of course absolutely nothing wrong with that. Therefore his new theatre front bears no trace of the traditional theatre proscenium. It is just black with a gold frame round the opening. Not only is it an anonymous black frame, but the opening is also bigger, 45 x 65 cms, thus making it possible to use characters up to 28 cms in height, more than double the usual height of a paper theatre character. “This neutral frame offers me quite different possibilities of development, as it gives no indication of how big the acting characters can be, and I therefore have no limits because of the perspective. In this way the frame becomes a window into the reality of the stage,” is how the theatre entrepreneur explains his artistic concept. Another advantage of the larger stage is that an audience of up to 50 people now has the possibility to have a good view of the stage from every seat. This makes the performances more economically viable. Benno is convinced that it is possible to make the paper theatre opera a commercial and more successful venture. “Rigoletto” is the first example of this new concept. All sets and characters have been enlarged to suit the new size, making the back drop up to 70 x 100 cms and with the characters in front up to 28 cms. The construction of the theatre is as before with a flying grid that allows a complete and immediate scene change by just pulling one bundle of strings. The increased size, however, also increases the actual weight to pull when you raise/lower 4-5 large sheets at one time. Similarly the extended height of the characters demands bigger turntables for the character slides to escape wobbling. The extensive use of the flying grid means that there is no room for light battens across the stage; it therefore has to be lit from the sides as appears from the photo. This also means that the characters always must stand slightly askew so as not to be in shadow. „The new stage gives me the possibility to work with professional stage lighting. 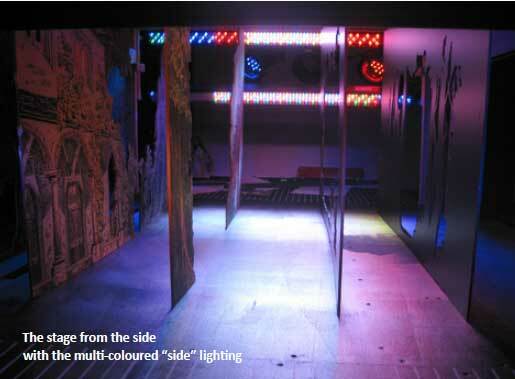 Light from above is only provided by three big theatre spots, which are placed above the proscenium arch Similarly a one meter long LED strip is placed before the stage opening as footlights,” is how the artist describes his lighting inventions. The new size also opens new ways of staging as regards the characters. The entire depth of the stage can now be used because the perspectively smaller characters in the background are still big enough to be seen by the audience in the back rows. In his approach to the opera “Rigoletto” Benno Mitschka sees the conflict and contrast in the title character’s love and care for his daughter as opposed to his scurrilous behavior to his surroundings. He is thus not capable of dissociating himself enough from his paternal love to acknowledge that Monterone may have similar feelings in caring for his daughter. This schizophrenic view will in the end also have tragic consequences for Rigoletto himself. The recording used was from the 1930s with the Danish singer Helge Roswænge as the Duke. As with all productions we are well within the naturalistic scenery, adapted by Benno from actual paper theatre (including d’Artagnan’s room from “The Three Musketeers”!) as well as from many other sources. The characters were based on very detailed contemporary costume sketches and worked very well even on the large scale. With the (minor) technical problems solved the “Multum in Parvo Opernhaus” will be able to continue as Germany’s Smallest Opera House, but twice as big. Dieser Eintrag wurde veröffentlicht in Über uns, Über unsere Inszenierungen und verschlagwortet mit flying grid, footlightm LED bar, Mering, proscenium, Rigoletto, Verdi von admin. Permanenter Link zum Eintrag.